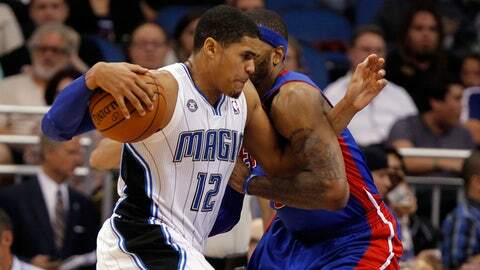 Orlando Magic small forward Tobias Harris (12) drives past Detroit Pistons small forward Josh Smith (6) during the second quarter Friday night. ORLANDO, Fla. — No one saw this coming. But after listless performances against Utah, Sacramento and New York, no one on the Orlando Magic was about to complain. Behind 23 points from Arron Afflalo and double-doubles from Tobias Harris, Nikola Vucevic and rookie Victor Oladipo, the Magic put together their best all-around game in at least a month on their way to a 109-92 victory over the Detroit Pistons. Arron Afflalo scored 23 to lead the way as the Magic took down the Pistons in Orlando. The Magic went 0-3 to begin a six-game home stand and had a 2-11 record in December. By contrast, the Pistons had seven wins in their previous eight road games, including victories at Miami and Indiana. The only loss during that stretch came at New Orleans in overtime. But you would have never known which was the hot team and which one was not. The Magic hit 56.5 percent of their shots through three quarters and neutralized pretty much everyone on the Pistons except for point guard Brandon Jennings, who finished with 21 points and eight assists. Vucevic had 20 points and 11 rebounds, while Harris outplayed Josh Smith on his way to a 16-point, 10-rebound night. Oladipo, who didn’t play at all in the second half Monday night, had 10 points and eight assists by halftime and ended up with 16 points and 11 assists. The Magic had not won at home since a 105-94 victory Nov. 27 over the Philadelphia 76ers. And they were able to pull it off despite going only 4 of 14 from 3-point range. They offset that by shooting almost 60 percent from inside the arc. The Magic followed up solid efforts in the first and second quarters by outscoring the Pistons 17-4 over the first six minutes of the second half to build a 20-point lead. Afflalo turned in his fifth consecutive game of more than 20 points while making Pistons rookie shooting guard Kentavious Caldwell-Pope a complete non-factor. After managing only seven points and five rebounds from their bench against the Knicks, the Magic got a combined 17 points in the first half from Oladipo and Ronnie Price. The seven points from Price were a single-game season high for him. Sunday night vs. Atlanta, 6 p.m. (FOX Sports Florida).